Most cookie recipes call for all-purpose flour. A very few require cake flour or bread flour; however, sometimes you need to work with what you have on hand. Understanding how to substitute bread flour and the likely result when you're baking cookies can help you make a successful substitution and a delicious batch of cookies. 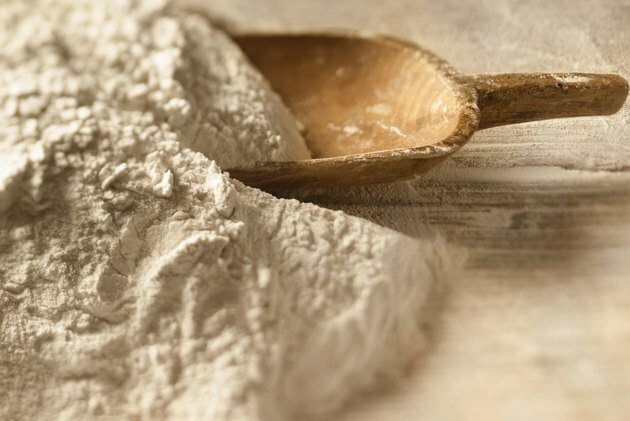 There are distinct differences between all-purpose, bread and cake flour. All-purpose flour is made from a mixture of soft and hard wheat and has between 10 percent and 12 percent protein. Cake flour has a lower protein level, producing more tender baked goods, while bread flour has a 12 percent to 14 percent protein level. Baked goods produced with bread flour contain more gluten, the protein that gives bread its structure, and may be chewier. Bread flour may be used in place of all-purpose flour in equal amounts, but the cookie will not turn out quite the same. You should expect cookies made with higher-protein bread flour to be darker in color and flatter. Bread flour may produce a cookie that has a chewier texture or one that is quite crisp, depending on the amount of liquid and type of fat in the recipe. Watch your cookies carefully to avoid over-baking. A few cookie recipes are designed for bread flour. If you enjoy chewy cookies, a bread flour recipe may work well, and you'll find that the additional fat and fluid in the cookie prevents the flatter, crisper cookie that can result from high-protein flour. Cookie recipes made to use bread flour contain additional egg yolks for moisture and may contain milk to keep the cookies soft. While bread flour works best for bread or some types of pastry, you may find that adding a small amount of bread flour is an effective way to change the texture of your favorite cookie recipe, particularly if you prefer chewy cookies to crisp ones. Add additional moisture to accommodate the change in flour by replacing one whole egg with two egg yolks and replacing white sugar with brown sugar if you're experimenting with this change. Baking 911: Cookies: What Went Wrong?